Important: You should call ahead the day you're heading out to get the conditions. Pick your own started June 12. PYO strawberries are $2.59/pound. Cash only. Bring your own container. "Picking has just started, the berry size is good, supply is good. The peak week for picking should be June 21 to June 26th." Indian Ladder Farms no longer grows strawberries -- "they are just too hard to grow well" -- so, obviously, there are no PYO. Its Facebook page says it is planning to have PYO blueberries and raspberries later in the season. Pick your own starts June 13. PYO strawberries start June 16. They're $3 per pound (2.50 per pound if you pick more than 15 pounds.) Four-quart containers are 75 cents. Bring your own containers or buy them there. There's a $5 per person minimum. Thompson-Finch is a certified organic farm. It posts daily updates on whether strawberries are available that day (they sometimes are picked out before the farm closes for the day). Check before heading out. PYO strawberries haven't started yet -- probably will be the weekend of June 24. PYO strawberries haven't started yet. Keep an eye on the farm's website and FB page. PYO strawberries haven't started, yet. Watch the farm's Facebook page. It sounds like it has a big crop this year. PYO strawberry season is planned to start June 19, according to answering machine. "Our berries are a bit behind this year because of the weather." PYO strawberries started June 12, according the farm's FB page. PYO strawberries are $3.49/lb per pound. Bowman typically has strawberries until the first frost. PYO strawberries opened June 12, according the farm's FB page. But check for availability and hours, because it sounds like the grow isn't fully in. The farm didn't have PYO a few days this week because the crop was pick out. Strawberries are $4.50 per quart (six for $25). PYO is at the corner of Swaggertown Road and Worden Road. We added Greene County last year after a request. If there are other farms from Greene we should include, please mention them in the comments. PYO strawberries started June 12, according to the farm's Facebook page, and the crop is just getting started. They're $2 per pound. 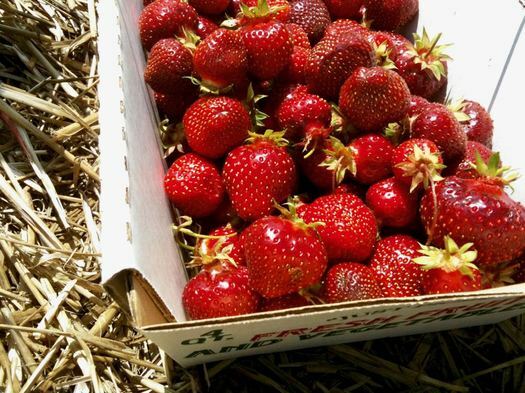 PYO strawberries started June 12, according to the farm's Facebook page. They're $3.25 per quart. They stand also has already-picked strawberries -- they're $5 per quart. PYO strawberries started June 12. They're $2.95 per pound. Season lasts 3-4 weeks. "The crop is just getting started. We should have berries into the beginning of July (weather dependent) we grow several different varieties that ripen at different times." Keep an eye on the Facebook page for updates.